State what your major heading (across the top) will read. See photo below. Include fax number if you wish to receive the diagram quicker. Please print the order form below, fill out completely, and mail with your check or purchase order for us to begin production. Please make sure you have received a current shipping/freight quote and have included it on the order form. We accept PO's from High Schools and Colleges only. If you do not have a purchase order we request a materials deposit (half the total cost) before we can begin production. We will mail a snapshot of the board when it is completed along with a bill for the remaining balance. The board will be shipped when we receive the remaining balance. All boards are securely packed and crated with 2x4's and plywood. They are shipped, insured, via overland freight due to their weight and size. 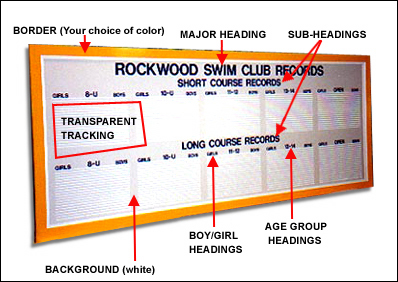 Packed boards range in size from 4 ft.x 4 ft.x3 inches to 5 ft. x 10 ft. x 3 inches. All shipments can fit in the back of a full-sized pickup truck and through pool doors. Deliveries via overland freight (18-wheelers) are different than UPS shipments. By completing this order form you are stating that you have read and understand the shipping information printed below the last section of this order form. Thank you for your business ! Shipping information: Quotes are based on shipment to a business address with individuals who can sign for the freight between the hours of 8 am and 5pm. Shipments to a residence, even if a business is located there, must be requested in advance and will incur additional cost. High schools, colleges or pool facilities should have an attended loading dock or a clearly marked space for deliveries from an 18-wheel truck. If they do not, they will be charged at a slightly higher "non-commercial" rate.